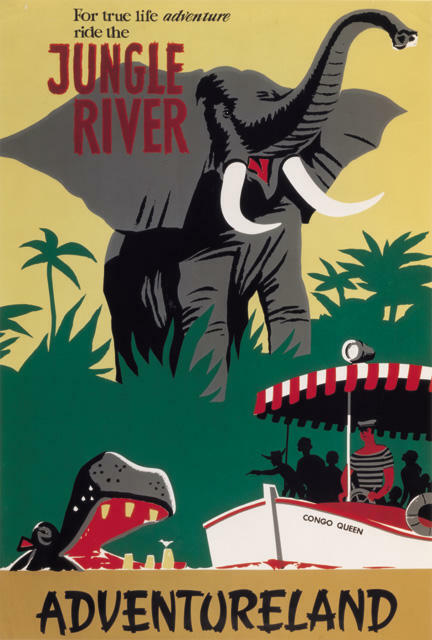 This week I’ve been reminded how many kindred spirits there are out there who are obsessed with mid-century American pop culture – the happy, whimsical and colorful images from commercial advertising, entertainment, tiki culture, and Disneyana. Some other folks just don’t see these images the same way. To them, mid-century art is just old. They might easily toss out as trash an old magazine or candy wrapper from the 1950’s, but not me. For me, it’s home. Maybe it’s a sign of the time of my birth. Being born in 1970 placed me pretty close to those golden days – the stuff was all around me. Maybe it’s a southern California thing, where the art and architecture of the 1950’s and 1960’s seemed to take a special foothold. Maybe it’s a combination of both time and place. I recorded a song about this called “Katella“, if you’re interested in hearing it. If not, keep on reading. Anyway, one particular artist who absolutely gets it is another southern Californian and a Disney designer/artist – Kevin Kidney. If you haven’t seen this talented gentleman’s artwork, go here. I’ve also added his blog to my favorite blogs on the right hand side of the Lost Transmission blog. He seems especially drawn (no pun intended) to work in tiki artforms, which is how I first discovered his work. He has recreated many of the figures and images from Walt Disney’s Enchanted Tiki Room in various forms. Incidentally, the Tiki Room is my top favorite Disneyland attraction. A close second is the Haunted Mansion. I have waffled for years between these two for this place in my heart, and I always come back to the Tiki Room in the end…but I digress. Mr. Kidney does incredible work in cut paper, and his blog includes links to some other incredible artists and Disney sites. I asked him a question about his paper art, as my 7-year-old son is currently fascinated with creating paper images of nearly everything. Kevin was very gracious in his reply and very encouraging to my son, who’s latest creation was a construction paper version of Brainy Smurf (I’d prefer Deputy Dawg, but at least he’s trying). I hope I’m raising a budding mid-century-inspired artist. I’ll keep you posted.